Peristyle Font Features: Stylistic Sets | Hoefler & Co.
Peristyle takes advantage of Stylistic Sets, an OpenType feature that makes it easy to transform text with a single click. Many fonts contain stylistic or functional variations of individual glyphs, commonly known as “alternates.” When using such fonts, designers have traditionally had to hunt for these characters in a vast palette of glyphs, from which individual characters could be inserted, one at a time, into the text. OpenType fonts, when used in a type-savvy application, offer a much more convenient approach: related alternates can be grouped together as “Stylistic Sets,” which when activated will render all the changes at once, throughout the selected text. Below are some of the Stylistic Sets we’ve created for Peristyle, accessible in the Adobe Creative Suite, Try.typography, the Cloud.typography webfont dashboard, and other supporting applications. In addition to its standard form, which follows the traditional diagonal construction, Peristyle includes a ‘commercial’ ampersand adapted from a cursive E, a design that comes to typography from signwriting. 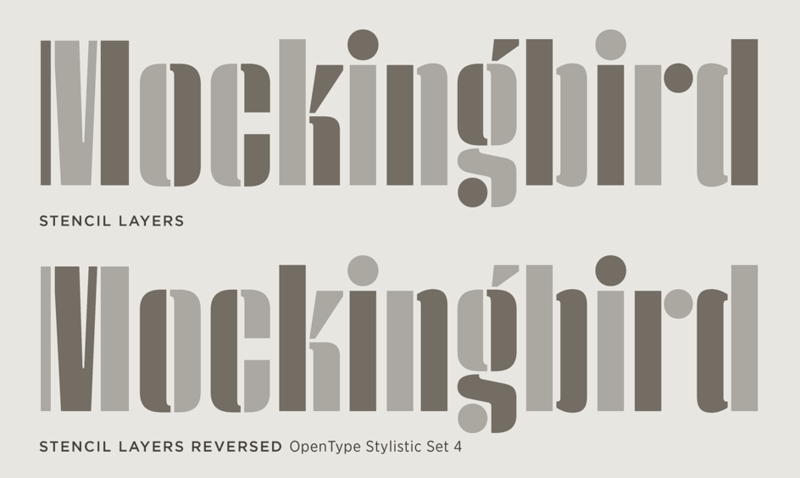 Stylistic Set 1 introduces this form in all of the Peristyle fonts. In its standard position, the colon sits on the baseline, to align visually with the position and scale of the lowercase. Each style of Peristyle includes as Stylistic Set 2 an alternate design for the colon, which is raised to center on the capitals and the figures, an appropriate choice when setting timetables. 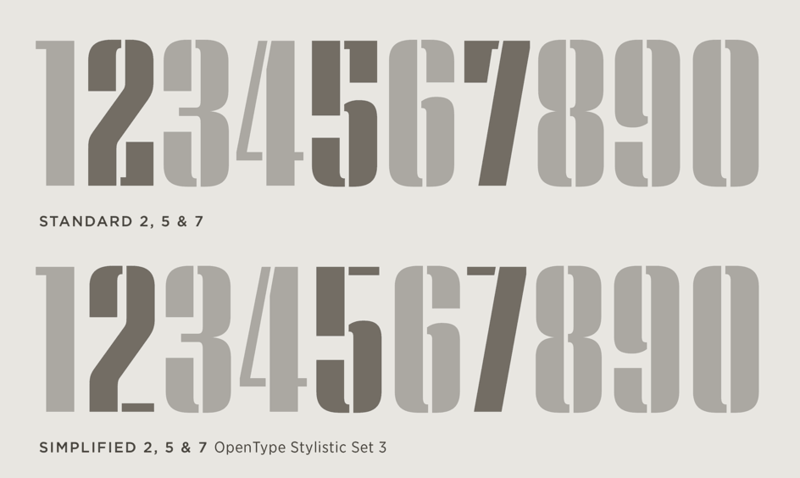 In Peristyle Stencil, the figures 2, 5 and 7 have been given serifs to increase their mass and improve their balance. These serifs can be removed using Stylistic Set 3, which restores the forms seen throughout the rest of the Peristyle family. In order to preserve an even rhythm, Peristyle Stencil’s two Layers fonts automatically vary the assignment of colors from character to character. To override this behavior and reverse the colors, activate Stylistic Set 4. Color Balancing. The bicolor ‘Layers’ fonts in Peristyle Stencil have built-in logic that automatically balances colors. Stylistic Sets. Peristyle uses an advanced feature of OpenType-savvy applications, allowing designers to transform the look of the font with a single click. Language Support. Peristyle features our Latin-X™ character set, covering more than 140 languages throughout the world — including all of Central Europe.